I share my favorite quote from “A Tour Through the School: What to Look For” because it reflects my ultimate goal. I desire to create an environment where students talk about books just like adults do. Discussing of what is read is a sharing of ideas and opinions. Discussion is what we engage in with a friend or airplane seatmate when we notice they are reading a book we have just read. Teachers lead discussions, helping the children take turns and adding to their ideas when appropriate. Discussion is not questioning. Questioning is an activity teachers do to “make sure children read it and got it right.” If after children read, teachers usually ask a lot of questions, children focus their attention on remembering. If after children read, teachers usually engage them in discussion, children focus their attention on understanding and deciding what they think. Questioning fosters remembering. Discussion fosters comprehension. To this end, I search for ways to manage the classroom when students are talking, to teach students how to talk to one another, to find ways to grade - just like any teacher does. I tackle simple participation first using Star Charts. Once groups master participation, I teach four goals of group dynamics I want students to master next. These goals are discussion goals that students learn in addition to practicing reading skills and strategies like determine author’s purpose and theme. Depending on the abilities of my class, I may add in these goals one at a time. (1) Ask lead questions. Lead the group into conversation by asking a thoughtful question that requires the help of others. Ask a question you cannot answer alone. (2) Build on other’s ideas to sustain conversation. Don’t ignore questions others ask. First, try to answer. Next, ask the member if the answer is adequate. Dig deeper to explain if it is not. In order to answer a question thoroughly, groups might discuss one question 5 minutes or more. They might consult other resources. That is okay. (3) Support opinions with evidence from the text or other sources. Go back to the text to answer a question. Use evidence to support opinions. Read directly from the book, summarize, or retell the information. In addition, bring other texts, movies, conversations and experiences to the conversation to use as proof. (4) Encourage one another. Use thoughtful responses. Use comments like, “That’s a good idea. I’d never thought of that.” Or, “We haven’t heard from Jerome on this one. What do you think?” Or, “That is really smart. How did you come up with that idea?” Or, simply, “Thank you.” So, pay attention to all members during discussion circles. Compliment peers or bring them into the conversation. To help students assess these four discussion goals, I created another mapping sheet of sorts. Basically, the teacher makes a table like the one below or the one I created for you. She tallies the number of times each participant demonstrates a goal. Teachers can total the scores. Students use the scores to set goals for improving their discussion skills. The first table represents a group discussing one question brought to the group by Jerome. The data shows that all participants discussed fairly equally. In the course of the discussion, students talked about evidence brought to the group’s attention by Jerome and Jazmin. Jerome encouraged his peers by either thanking them, asking someone what they thought, complimented a peer on finding evidence or providing a satisfactory answer. This response log serves as evidence that this group most likely sustained discussion on one question, sought evidence to support their opinions, and worked together well. The next response checklist shows that the readers brought questions to one another but must have discussed each question for a very short time. Note that the students discussed 10 questions in the same amount of time as the group above that discussed one. It stands to reason that the discussion must have been shallow to work through each question that fast. Also, no one presented evidence for the group to consider. Personally, I tell my students that I would rather see groups mapped out like the one above. In that case the students launched the discussion, listened to each other’s opinions, asked follow up questions, and looked in the text to find evidence to support their opinions. The checklists are very adaptable, provide data of the dynamics of the group, and serve as a baseline so that students can measure growth. Obviously, teachers can use checklists to assess how groups operate. The teacher might share and discuss the consequences of this data with her students. In addition, I’ve adapted the checklist to map large-group discussions like Socratic Seminars. Plus, I’ve changed the column headings to focus students on different goals. 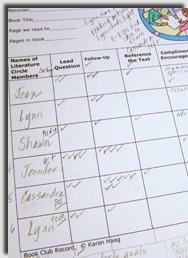 Students can map discussion of their groups as well.